Donuts are the ultimate in breakfast food treats. 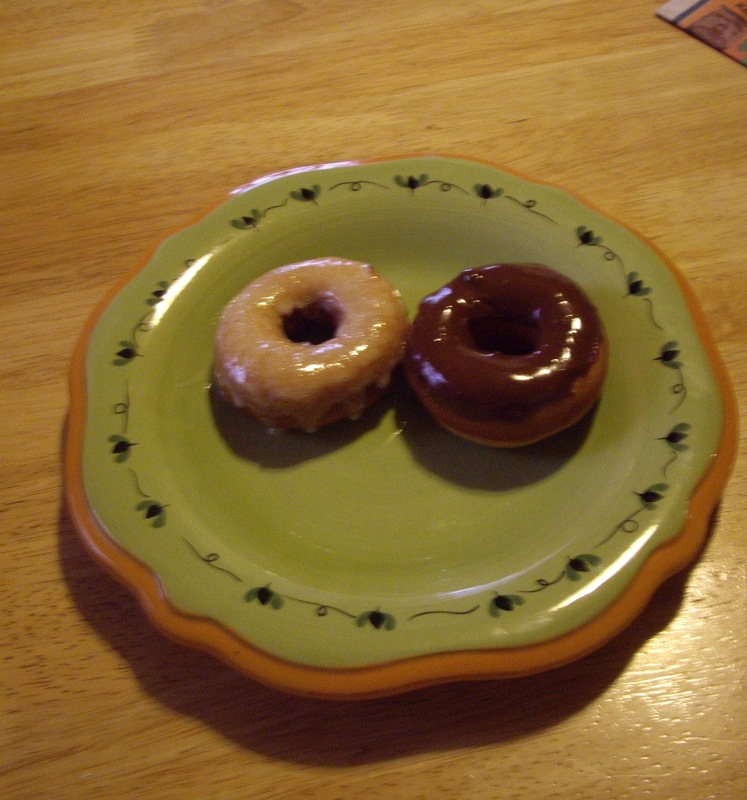 Donuts are made two different ways. 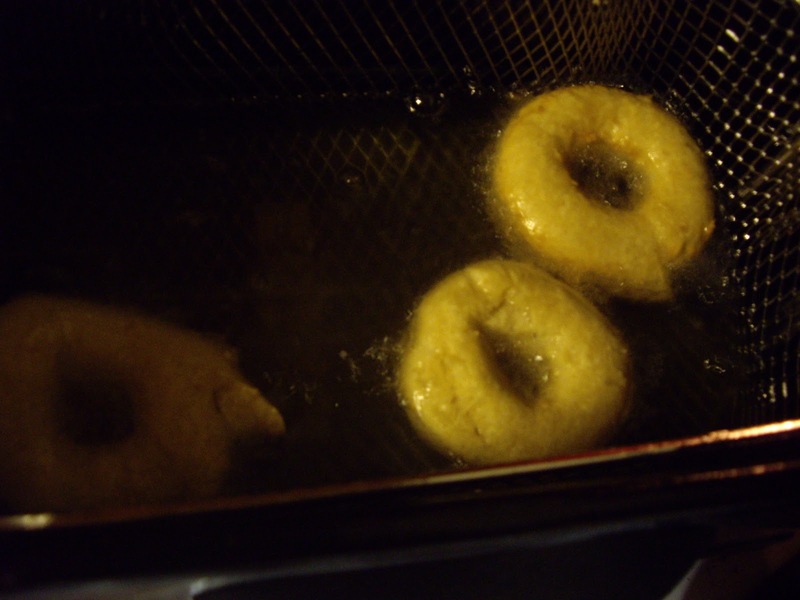 You can have cake donuts or you can make raised donuts-also known as yeast donuts. Some bakeries sell both kind. Krispy Kreme and Dunkin Donuts specialize in the yeast kind. My mom always made cake donuts. I prefer yeast donuts so that is what I normally make. If you’d like cake donuts, follow the link to my recipe for those. You will need a donut cutter. You can find them on Amazon.com if you don’t have a local place to get one. You need a rolling pin. You will also need a deep fat fryer OR a 3 quart saucepan. A hand mixer comes in handy for making the glaze. You can use it for the donuts, but not necessary. 2 to 3 cups cooking oil for the saucepan. You may need need more if you have a fryer. In a small saucepan; add the milk, butter, sugar, and salt. Heat over medium low until the butter just starts to melt. Remove from the heat and add to the dissolved yeast. At the same time, add the egg. Stir or mix with your mixer. Add half of the flour and beat in. Add the rest of the flour and knead the dough until smooth. If using a mixer and you have a dough hook, switch to that before adding the second batch of flour. If you are using a stand mixer, it may seem like you need to add quite a bit more flour. You don’t. If you do, not more than a few Tablespoon or the donuts will turn out heavy instead of light and fluffy. Cover the bowl of dough with a towel and let rise until double. This will take 30 minutes to an hour, depending on the warmth and humidity of the room. It is ready when you can poke the dough with your finger and the indention make stays. Roll the dough out to about 1/2″ thick. Dip your donut cutter into flour and cut out your donuts, rerolling the dough as needed. If your donuts are floury, you may want to brush them off. Cover the donuts and donut holes with a towel and let rise until double. This will take 30 to 45 minutes. Pour the oil into the pan OR fryer and start heating it up. Set your temperature to 350 degrees Fahrenheit/175 Celsius. To test the correct temperature when using the saucepan, try throwing a small scrap of dough in the oil. If it bubbles immediately, it is ready. If it doesn’t bubble the oil will soak into the dough before the donut is cooked. Fry the donuts 3 to 4 at a time. You can do all of the donut holes in one batch though. Let fry 30 seconds on one side. Turn over and do the other side for 30 seconds. You can shake in powdered sugar, cinnamon sugar, or use a glaze. Beat the butter and powdered sugar. Add the vanilla and hot water. Mix until smooth. To make chocolate glaze, stir in the chocolate chips until smooth. Dip the tops of the holes and donuts into the glaze. Makes 12- 15 donuts plus the same amount of donut holes. For other flavored glazes, try using other flavored chips. You can also make the dough the night before and refrigerate. It will slowly do it’s first rise overnight. Take out and let stand about 15 minutes and than finish making them. 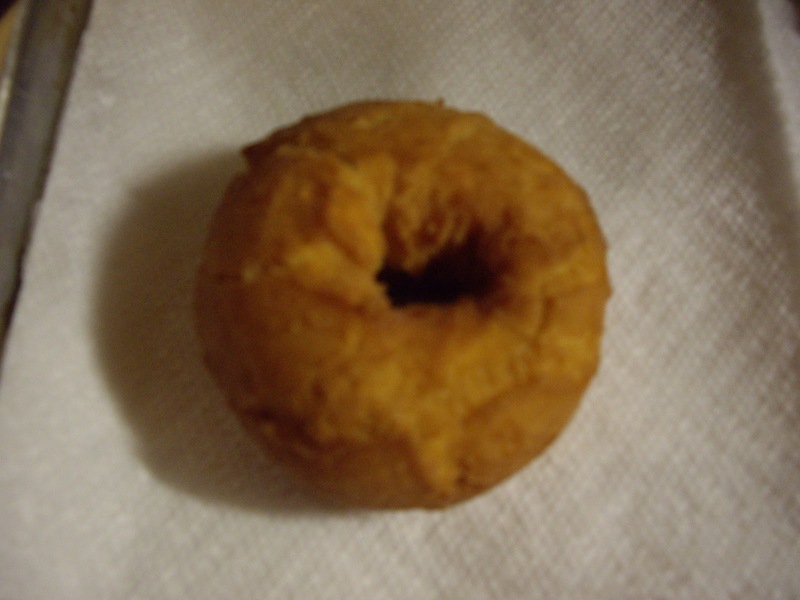 Cake donuts are flavorful whether you have them plain or coated with sugar. They are pretty quick to make too. You can make a batch of these in under an hour. Unlike raised donuts, which are best eaten within a few hours of making, these will keep a few days. My mother used to make these a lot when I was growing up. You will need: either a deep fryer filled with cooking oil or a wide pan with 2″-3″ of cooking oil heated to 375 degrees Fahrenheit. You will also need a donut cutter. If you don’t have one and don’t want to buy one, you can use a a 15 oz can that has been washed out and has both ends cut off. 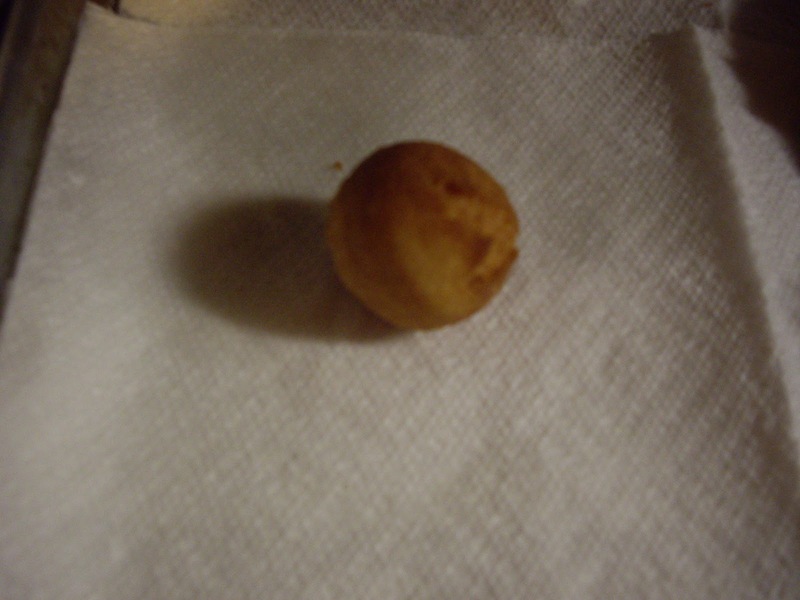 For the donut holes, use a plastic bottle cap- about the size of a soda pop cap. In a mixing bowl, put 1-1/2 cups of the flour along with the butter, eggs, milk, cinnamon, nutmeg, baking powder, sugar, and salt. Beat well and scrape the sides of the bowl. Mix for another couple of minutes. Start to preheat your oil. Flour a counter or board really well. Dump the dough out onto the counter and flour the dough. If the dough is really sticky and soft, work in some flour. Maybe a 1/2 cup or less. Pat or roll the dough out to about 3/8″ thick. Dip your donut cutter into flour and cut out donuts. Reroll as needed to use up the dough. Carefully slide the donuts into the oil. Do the same thing with the donut holes. Cook the donuts 1-1/2 minutes per side. The donut holes tend to float up and flip over so they won’t need turned. The donuts float up, but do need turned. You can do about 3 or 4 donuts at a time. You can do 6-8 donut holes at a time. More than that will lower the temperature of the cooking oil. Drain the donuts and holes on a paper towel. After you have let them drain and cool slightly, you can eat them or coat with powdered sugar, sugar, or cinnamon sugar. 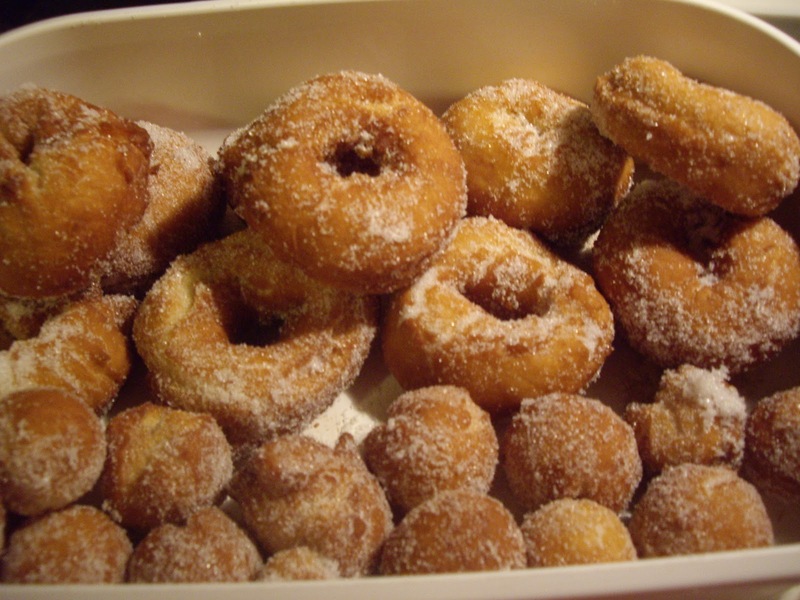 To coat, put the coating in a container with lid and add a few donuts. Remove and repeat with the rest of the donuts and holes. You will get 16-18 donuts. And, that many holes of course.